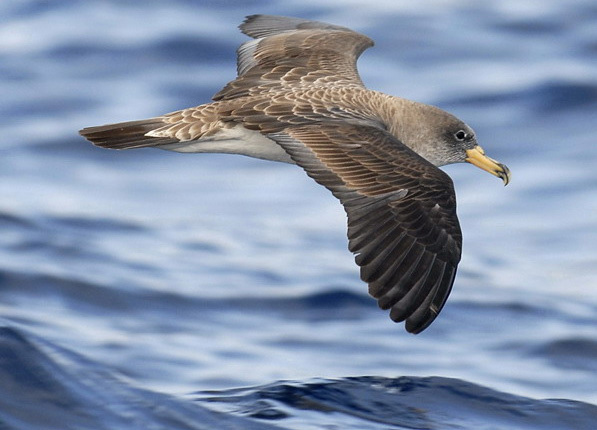 It’s the time of year again when we all need to be on the lookout for the injured chicks of the Pardela Cenicienta, (Cory’s Shearwater in English). These birds are protected in the Canary Islands and the Medio Ambiente will arrange to collect any injured bird which is reported to them. The birds will be cared for, and those which recover will be ringed and set free. The cliffs of Los Gigantes are an ideal nesting place for these birds however, there are dangers too. These birds fly at night, you’ll probably not see them but we hear their calls. The fledgelings get confused by the street lighting when they fly over Los Gigantes and often crash land, stunning or injuring themselves . This leaves them prey for cats and dogs. This is where you can help if you come across one. Carefully catch the bird and put it in a box, as they are usually stunned youngsters they can be caught fairly easily! (We had an amusing time last year when we found one in our swimming pool. It took two of us in the pool at midnight to catch it. Fortunetely it seemed to be only stunned). Keep the bird in a dark place until morning, there is no need to attempt to give it food or water. Take it to the local police station where they will arrange for it to be picked up by the Medio Ambiente.